Before sending your email message or sharing your document or spreadsheet, run the Accessibility Checker to make sure your Microsoft Office content is easy for people of all abilities to read and edit. On the ribbon, select the Review tab. In Outlook, the Review tab is visible in the ribbon when writing or replying to messages. Review your results. You'll see a list of errors, warnings, and tips with how-to-fix recommendations for each. See Rules for the Accessibility Checker for more information. To easily address accessibility errors and warnings, select an issue to open the Recommended Actions list. You can apply a one-click fix by selecting an action, or select the arrow button next to an action for more options. 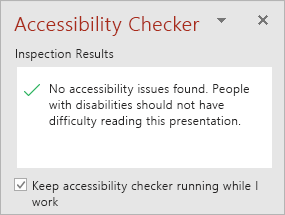 To be notified of accessibility issues in your document as you continue working on it, tick the Keep accessibility checker running while I work check box. This adds the Accessibility button to your status bar, and keeps track of accessibility issues in real time. You can open the Accessibility Checker whenever you want by selecting the status bar button. If you don't see the Check Accessibility button on the Review tab, you might have an older version of Word, Excel or PowerPoint. Follow these steps to open the Accessibility Checker. Select the Check for Issues button. Tip: To the right of the Check Accessibility button, under the Inspect heading, is a list of any potential issues. In the Check for Issues drop-down menu, select Check for Issues. 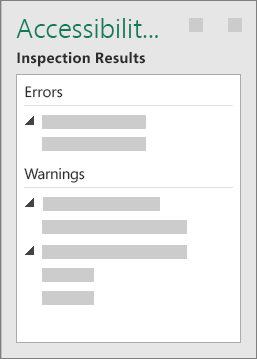 The Accessibility Checker task pane appears next to your content and shows the inspection results. To see information on why and how to fix an issue, under Inspection Results, select an issue. Results appear under Additional Information, and you’re directed to the inaccessible content in your file. Before sending your email message or sharing your document or spreadsheet, run the Accessibility Checker to make sure your Office for Mac content is easy for people of all abilities to read and edit. 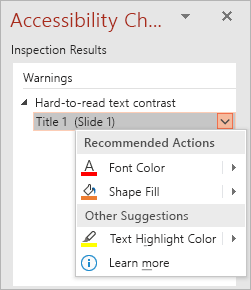 In Word, Excel, and PowerPoint, select Review > Check Accessibility. In OneNote, select View > Check Accessibility. In Outlook, while writing or replying to an email message, select Options > Check Accessibility. Select a specific issue to see why you should fix the issue and steps to take to change the content. 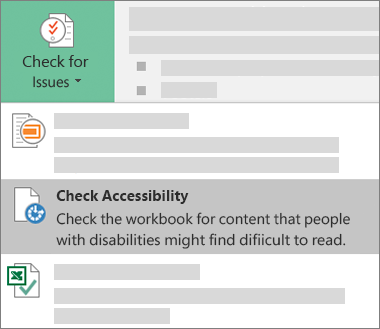 Before sending your email message or sharing your document or spreadsheet, run the Accessibility Checker to make sure your Office Online content is easy for people of all abilities to read and edit. On the ribbon, select the Review tab. In Outlook Online, the Check for accessibility issues button is located in the ... (More options) menu, which is available on the top and bottom toolbars when writing or replying to messages. Review your results. You'll see a list of errors, warnings, and tips. See Rules for the Accessibility Checker for more information. Click on an entry in the accessibility issues list to highlight the corresponding part of your document.